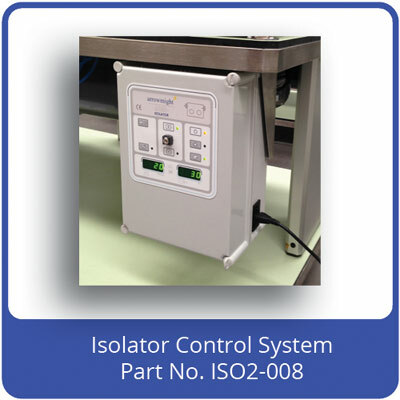 What is the Isolator Control Systems ? All clean air and containment equipment generally has a number of fans and HEPA filters, often referred to as the air handling system. Other components such as digital displays, alarms and lights are also common for this type of equipment. To allow the fans to be switched on/off and maintained at a certain duty, a control system is required. This normally comprises a control panel with switches and indicators on the front of the equipment, connected to a main circuit board located behind in an electronics bay. Some systems also have additional fan speed controllers if the fans are mains powered. Any other electrical devices such as interlock electromagnets or automatic self tests are also controlled by this system. Control systems are designed specifically for our customers' requirements and may be used to control any type of clean air or containment device. These include: isolators, air management units, allergen control enclosures (down flow booths), VLF/HLF (vertical/horizontal laminar flow) cabinets, transfer hatches with electromagnets. A control system panel has various switches to allow the operator to select fans, lights, alarm test functions etc. It also has LEDS to show switch selections and various digital displays. Normally these are used to display air change rate (ACR) or down flow, and internal pressure. The control panel is connected to the main circuit board which sends speed control signals to the fans and houses the sensors to drive the digital displays. QAT control systems have several unique features which give them an advantage over conventional systems. Firstly, they are low voltage and inherently safe, but can control almost any type of fan including 24 VDC , PWM or analogue (0-10 VDC) controlled, or 230 VAC. Secondly they can control the fans fully automatically, so no setting up is required. Thirdly, the systems can carry out a fully automatic self test and some variants can be linked to VHP (vaporised hydrogen peroxide) decontamination generators (such as Bioquell Clarus and Steris). All our circuit boards are also fitted with an RS232 socket which can be used for wireless data logging etc.